They were born within 3 minutes of each other in July 1996 but the Diaz quintuplets from Texas are making history as they graduate together from the same university, with 5 different courses! Enna, Maria, Emilio, George, and John Diaz, all 21 years old, recently graduated from the University of North Texas with degrees in biology, finance, Spanish, social communication and art. The five did not just share the same womb at the same time, they also shared a lot of things as they grew up. They went to the same schools together, from kindergarten to grade school to middle school to high school to college! When they were accepted at the university, they spent the first two years in adjoining dorms in the same college houses. They were still inseparable despite taking different courses. During major examinations, they would go to the library and study there as a team. In their third and fourth year in college, they rented an apartment so they can live together. “I think college can be a daunting thing to go into alone. I feel very lucky to have had the support of my family. We would see each other every day and we’re constantly in touch on our group chat EGMTE,” revealed the eldest of the quintuplets, Enna who graduated from BS Biology. Since they were really used to being together, they functioned better as a team. Even with different courses, they ended up helping each other. Knowing that putting them to college can be a huge burden to their salesman dad, the quintuplets made use of the university’s financial aid program, took student loans, and also worked part-time in restaurants. Their parents were understandably over the moon! “It’s not every day that you have one kid graduate from college, let alone five!” their dad, George, told reporters. 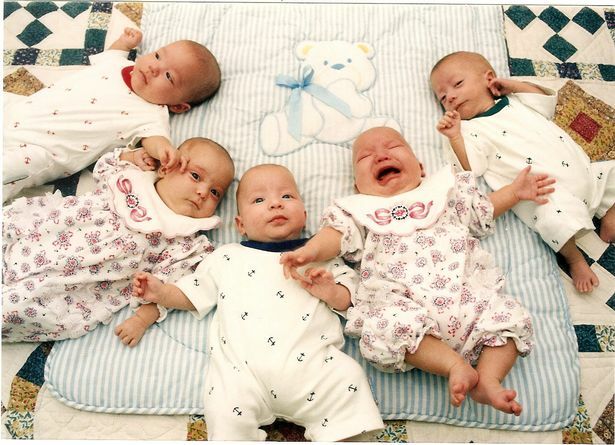 He admitted that when the quintuplets were born, he had no idea how he would ever be able to raise them and send them to school but they all managed to do it.